Federal investigators are looking into an arson fire that burned the Missouri church where Michael Brown's father was baptized over the weekend. "This is a slow and painstaking process," said John Ham, a spokesman for the Bureau of Alcohol, Tobacco, Firearms and Explosives, which is working with a local task force on the case. 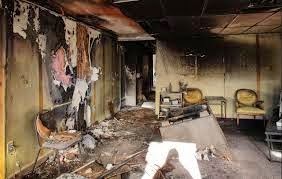 Flood Christian Church was torched Monday night after the announcement that a grand jury had voted not to indict Officer Darren Wilson in the shooting death of unarmed teen Michael Brown Jr. The church went up in flames around the same time about a dozen other buildings were set ablaze in Ferguson by protesters angered by the grand jury's decision, but it's on a remote section of West Florissant Avenue where other structures were unscathed. "The police called me and told me the church was on fire," the Rev. Carlton Lee said. "I was in complete disbelief. I didn't think anyone would set a church on fire.